This home will steal your heart with how well built, thought out and maintained by the original owners. The craftsmanship shines through when you notice the little things like the wood doors, etched glass front door, expansive back deck, beautiful hardwood floors, soaring height on the front porch and the additional bedrooms on the lower level walkout. This home comes with 4 bedrooms up, 2 below and 3 full bathrooms, a 2.5 car attached garage and 4 additional cars can fit in the pole barn at the front of the driveway. 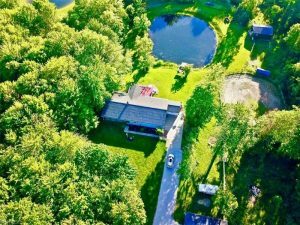 Enjoy the days overlooking the property and stocked pond from the beautiful back deck. There is a barn with 3 stalls on the lower level and an area for hay above. There are two paddocks along with an outdoor arena right next to the tack room separate from the barn. Enjoy easy living with the ability to get where you are going with being just minutes from freeway access. To view more visit our listing tab…..